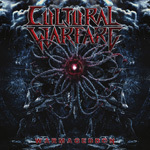 Cultural Warfare are a thrash metal band from the USA forming in 2010, releasing two E.P. 's, 'Ratten Krieg' in 2012 and 'Future Kill' in 2017. The bands debut full length offering 'Warmageddon' was released in 2018. The San Francisco Bay Area thrash metal explosion of the mid eighties through bands such as Exodus, Death Angel, Testament and (of course) the "big 4", has played a major role in the musical development of American thrash metallers Cultural Warfare. Last years E.P. 'Future Kill' was an aggressive aural assault of ferociousness, and with their debut full length offering 'Warmageddon', Cultural Warfare are as aggressive as they have ever been. Get ready for a fast and furious journey of hefty head banging as the album explodes into life with the title song. Full of pace, 'Warmageddon' is skull crushingly heavy and breathes venom as it scurries hastily across the earth. Cultural Warfare are back, and firing on all cylinders as the album rockets forward with 'Divided We Crawl'. Faster than the opening salvo, 'Divided We Crawl' sounds like the offspring of a Testament/Overkill one night stand, as it hurtles on at break neck speed. I really hope you've done some proper warm up exercises on your neck muscles as your head will be nodding back and forth so fast you won't know what day of the week it is! The pace of the album is relentless, with 'G.O.D.' a much heavier foray into the deep dark depths of the thrash metal genre. This is cracking stuff from a relatively young band, a hungry band full of passion and exuberance. 'Warmageddon' (the album) is energetic and fiery thrash metal straight outta the top drawer. I am hoping not to run out of superlatives for this album, an album of excitement and exhilaration that just gets better with the more melodic edged 'Eyes Of The Land'. Displaying the kind of finesse that Metallica brought to the thrash metal genre with 'Master Of Puppets', 'Eyes Of The Land' is a border breaking song that strides into the heavy metal genre, appealing to a much wider audience. Haunting and chilling, 'Two Spirits' eerily creeps in to the fray with a menacing vocal performance, scary enough to raise the hairs on the back of your neck in fear. Hitting heavier than a wrecking ball, 'Two Spirits' creates a creepy atmosphere, becoming faster and faster as it crescendo builds towards its finish. There is no getting away from the fact that this is an out and out thrash metal album. From song one to twelve, the pace is breathless, the aggression menacing and the head bang ability is off the scale. 'Politikill' brings a touch of the German style of thrash metal to the album, the kind of brutality that Kreator brought to the genre. Picking up pace, 'Scars Left Cold' takes off at break neck speed and is a ferocious rampage of thunder. Violent head banging is the only style that can accompany thrash metal this fiery. Bold, blunt and brutal, 'Punished' hits very hard. If you're brave enough to stand up to the aural assault 'Punished' unleashes, then you best be prepared to be hit firmly and squarely in the forehead and knocked into next week. 'Punished' is a punishing five minutes of brutality that is gonna leave you battered and bruised. 'Witches Prayer' is heavy and menacing, reminiscent of the brutal mid tempo aggressiveness that both Slayer and Kreator offer. The vocal performance is venomous and as 'Witches Prayer' progresses, a turn of pace sees it scorch the earth as it flies along at high velocity. One of my favourites on the album is 'Shadow Priest', although every song is a favourite... 'Shadow Priest' turns in a cracking performance and is perfect is every respect. It has pace, brutality, aggression and venom, and can best be described as a blend of three of the greatest thrash metal bands to have ever emerged, Kreator, Slayer and Testament. I am so hooked on this album I never want it to end...but with song eleven about to begin I know it's going to soon, but I also know where the replay button is...oh yea! 'Blood Machines' is a full on savage rampage of brutality. Pace and power flow in abundance as 'Blood Machines' sets a blistering pace, heads banging as furiously now as they were nearly an hour ago when the album first began. 'New Beginnings' brings a great album to a close, all mellow and menacing, it sounds like it should be an intro, not an outro...maybe it's a teasing intro for the bands next album? 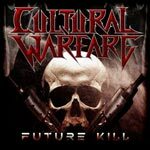 Overall, a superb thrash metal album, Cultural Warfare have delivered a fierce and furious barrage of brutality and aggression.